Armed with her 'Momochi' nickname and her charming personality, Tsugunaga Momoko is flourishing on variety programmes. The group that she was attached to, Berryz Kobo, is currently in a hiatus, but she currently acts as Playing Manager for Country Girls. She spearheads the members through friendly competition, despite a nearly 10-year age difference. This time, with the release of their 4th single 'Do Datte Ii no / Namida no Request', we ask her to talk about her activities as part of Country Girls and as Momochi. 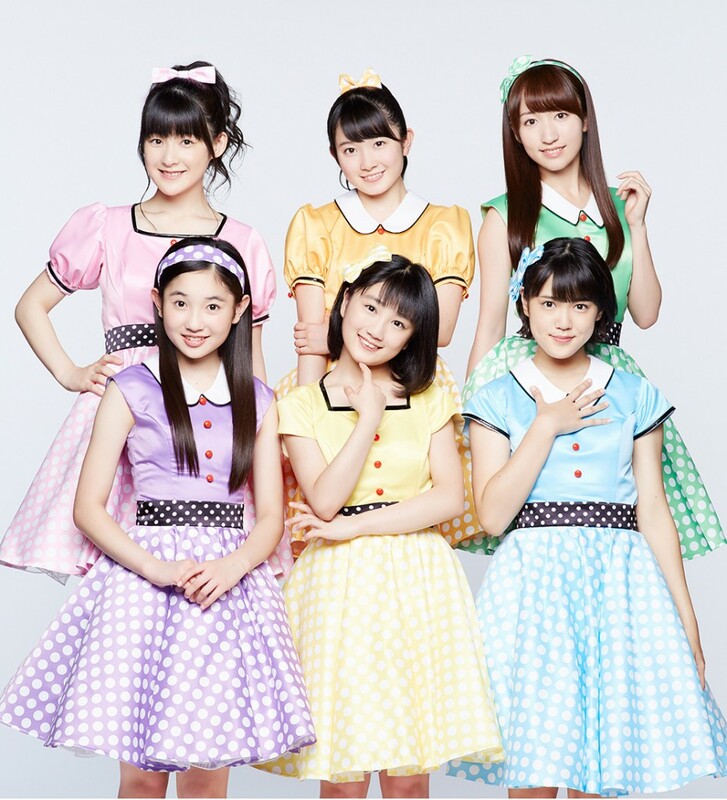 - Your 4th single 'Do Datte Ii no' is a nostalgic, rockabilly-style song. Just the title might make you think that it's a reckless song. But it's a really forward looking song, the lyrics talk about a person who doesn't really care about things beyond what they believe in. The titular 'Do Datte Ii no' phrase appears more than twenty times, so the song really sticks in your head. The melody has a rockabilly taste to it, but ever since our debut single, we've been singing songs that have a hint of nostalgia in them, so this is just an extension of that. 'Cuteness' is the main thing that Country Girls pushes, but this song seems to question whether we can pull off cool, not just cute. So we're giving it a try! - Did you know what rockabilly was when it was first mentioned? We touched a bit on rockabilly during our previous single 'Boogie Woogie Love', so I knew what it was. - Though you say that it's nostalgic, it'll bring up a sense of nostalgia for people who are roughly in their fifties or sixties. Our outfits have us wearing red pumps, and we incorporate the twist in our MV, so those who watch it can enjoy the nostalgic feel. - Nakajima Takui-san did both the lyrics and the composition. Yup, it's a first for Country Girls. - I had a look at Nakajima-san's liner notes, but he wrote about complicated, music-related things. Little Richard, the Beatles... Are you following me? Nope, not at all (clearly). That's pretty much 'Dou datte ii no' to me, I don't really care about it. - (Laughs) Nakajima-san's a natural-born musician, so he's passionate about it. He himself harmonises in it, and Takui-san himself was also focusing on certain things when he made this song, so I'd like to properly live up to his expectations. More than anything, I'd be happiest if those listening to it think of it as a good song. - In the past, have you interacted with Nakajima-san? On the topic of interacting, I just happened to be at the office when Takui-san was doing an Internet broadcast, and was told to sing on it (laughs). And I appeared on the broadcast, somewhat unsure if I should be there. Ever since then, we have friendly chats whenever we meet at the office. - You work together for 'Satoyama & Satoumi he Ikou' as well, right? It's an event where everyone in the company talks about the wonders of the mountains and the sea, so we're often together in those. We'll be having a 'Asobu. Fureau. Taiken suru. Satoyama & Satoumi Aki Camp in Isumi' in Chiba Prefecture on the 10th of October, so everyone, please come! - You'd like fans of Takui-san to listen to the song as well, right? Please listen to it. The instrumental is packed with Takui-san's voice! - So Takui-san's fans should buy it just to listen to the instrumental. Yup, it's even got him whistling! - That's a new way of selling it, asking them to buy it for the instrumental. And, 'Namida no Request' is a cover of the Checkers. All six Country Girls are born in the Heisei era, so we honestly didn't know about this song. But when I was practising the song in the living room, my father and mother went 'Eh? This song!?' with surprise. - They hadn't expected that their own daughter would be bringing out a song by the Checkers into the world. It was unusual, they really got into it. - It hit the right notes with your parents. That song has lots of words that ooze with nostalgia from those times. There were lots of things that I didn't understand, like 'I'll pack my prayers into my last coin, Midnight DJ'. When I asked the grown-ups, I was told that it was a system where you could make song requests on the radio using a 10 yen coin. Nowadays, we can submit those requests using apps, but that was how it was in that age. The transistor radio and silver locket references had me going 'Eh?' And then, it's a song from a guy's perspective, so as a girl, while I can empathise after the fact, it was difficult to properly express it on our faces, and we did our best to not destroy the Checker-san's image. But, since we're a cute female idol group, I think that it was nicely done with a bit of a pop arrangement. - Did you feel the pressure of having to cover one of the Checkers' renowned songs? I definitely had to brace myself. We couldn't do it if it came off weird, right? - You wouldn't be able to pull it off if it came off weird, right. However, everyone really came together to make it. - Momochi-san, are you yourself an acquaintance of any of the Checkers members? Fumiya-san, for example. I wouldn't say that we're close-knit acquaintances, but I've met him on music video programmes. However, the members actually tweeted about this song on Twitter. When the MV went public, Tsuruku-san retweeted it. - Oh, I was kind of thinking that it would be Tsuruku-san. It made me happy that it got retweeted on the day it was unveiled. - Quite a number of fans of the Checkers will know about it as well. How do I put this. Of course we can't say something impudent like 'Please acknowledge us', but it would make us happy to be told that Country Girls' 'Namida no Request' is good as well! - However, the members don't have individual Twitter accounts, so you couldn't respond, could you? That's right, we don't have individual Twitter accounts! But there's an official Country Girls Twitter, right? Did you retweet it? Staff: I think we retweeted it. - Well, you're doing your best for Tsuruku-san's sake as well then. Yes. We'll be doing our best. - How is it like, working together with younger members? You know, in the best of ways, the mood of Country Girls is that we aren't from the present. How do I put this, we don't have any girls that are lacking and need polish (laughs). It leaves us with a bit of a timeworn feel. - I suppose you mean that in the best of ways. Yup, so I think that in that way, our group makes a really good fit with these sorts of nostalgic songs. - You're also preparing for your live tour. Things'll be pretty packed until the end of the year. On the 5th of November, we'll be celebrating 2 whole years since our formation and will be entering our third year, but lots of people have said that the third year is when the real fight begins. Although I think that every year is a fight... We can still get the newbie treatment up until our second year, we'd still be able to get away with things because we're newbies, but it's common to suddenly lose ground in the third year. I really think that I'd like to intensify our talks and performances to properly bury that concern. - In Country Girls, you're the only one who's experienced the '3rd year jinx' for idol groups. That's right (laughs). I feel that the change is more on how those around us perceive us, rather than us changing in any way. It's a reminder to brace ourselves. - What advice would you give them in order to make sure that they've braced themselves? Once rehearsals for the live tour start, I'll point things out (grim look on her face). - Do you often scold the members? I don't scold them like 'Do this, do that'.... But when push comes to shove, and I have to tell them off, I really have to consider whether it's something that I myself can't do. You know, if not, I'd get shut down if they were to comment that I can't do it either (laughs). - It would be terrible, wouldn't it? To be presented with a statement like that. It would be pretty bad even if they thought it without saying it, so I'll have to focus. - Satoda Mai-san might be watching from NY as well. That's right, yeah (laughs). I just sent her our CD of my own accord, to New York. A signed one. - She might listen to it together with her son. I think that the music one listens to when they're little will have a big effect (with a triumphant look on her face). - A special education through listening to lots of Country Girls' songs! Indeed. That's great. By the way, heading towards your third year, how do you evaluate each of the members from your Playing Manager's eyes? Yamaki Risa-chan has a five year difference in age from our youngest girl, and there's also five years between me and her, so she's like the middle management (laughs). But she neatly makes that five year gap both above and below seem to disappear. On the singing aspect and the talking aspect, she's a really level-headed girl, she's an always reliable kouhai. Morito Chisaki-chan is a senpai to Funaki Musubu-chan and Yanagawa Nanami-chan, having joined a year before them, but I guess you could say that she can't get rid of that sense that she's biggest novice (laughs). - Unable to get rid of that amateurishness (laughs). - All of the sudden? She's a girl who thinks things like 'Why are people born...?' Perhaps because of that, despite her mature looks, I think she might be the most childish, with an energeticness that's right for her age. - And the new members? Yanagawa Nanami-chan is a girl who possesses a unique perspective on the world, and she's got a staggering vocabulary thanks to her hobby of reading. Looks-wise, she's of small stature and with a childish face, so she really has this air of being some sort of child actress (laughs). However, she joined us having only been part of the H!P Kenshuusei for half a year, with no other entertainment industry experience besides that. She's so impressive that it's almost unbelievable. - Even when we interviewed her before, she truly did seem like a child actress. (Laughs) We still haven't grown used to it, so it sometimes perplexes us... However, she really can sway the mood, so I hope that she forges ahead on her own path. Funaki Musubu-chan's the youngest, but her singing and dancing are truly intense. Her singing in 'Do Datte Ii No' is really powerful, it surprised me the first time I heard it. But I think that both in singing and dancing, she's got skills that are encroaching on the upper echelons of H!P, so I hope that she'll polish herself even further. It's like, she takes huge strides, like she's able to make huge skips. Her strides are amazing. Well, I'm not really sure (laughs). What's more, I've only seen her 'Typing on a computer' once. I saw it on a video somewhere, but it looked unexpectedly normal. - Well, that's no good then? Well, maybe she's fast for a middle schooler? It was at the level of a run-of-the-mill office worker (laughs). - At office worker level! In that case, she should fully concentrate on increasing the length of her skips. That might give it some impact. Well, her skipping isn't at an eye-boggling level either though (laughs). Having raised the stakes so high, I watch over her with warm eyes as I feel sorry for her. She's still fourteen, so she's still flexible. - For Country Girls, as the Playing Manager who will be hitting her third year, how do you lead them? I always think that I'd like us to be a group that's going on the royal road of idols. - Momochi-san, you've experienced huge venues such as the Budokan through Berryz Kobo. What is your goal as Country Girls? How do I put this... While it's fine to have an easily understandable goal such as the Budokan, I also feel like I don't want that to be the goal. At the moment, I think that perhaps we should rush headlong into what's in front of us, thoroughly going through each and every job, moving up in stages. While actually achieving a goal that we've set would give us a staggering sense of achievement, I feel like while we're still at this stage, I'd like to go through our activities with something else beyond just that. - These opinions of yours, do you properly convey them to the staff and the members as the Playing Manager? No, I don't, I don't really understand the PM role (laughs). I'll be entering my third year without understanding my role. - Is that so (laughs)? For the office, as there's quite a difference between my years in the world of entertainment compared to the others, they somehow or the other gave me some sort of managerial position, something like that. - Like a section chief? My my. It's like recently, I think that I've gotten a glance into the considerations that the office makes. - Is that all right? Playing Manager? But hear me out! If I were in charge of thinking of everything, I might get in the way of letting those girls learn to reason by themselves. And so, I keep track on what everyone has thought about. - You see them from a closer point of view compared to a manager? - And that's the Playing Manager. - I'm sure you just thought that up on the spur of the moment (laughs). Nope, nope. Since two years ago (laughs). - Have the fans not expressed any of their opinions? You see, leaders are people who are in a position where they apparently have to lead, and I'm not just talking about idols here. Some Japanese have a tendency to overthink things, so if there are any issues, they should be more comfortable with asking those around them for a hand... like the kouhai, or if we're talking about an office setting, one's subordinates. There's like a kind of pressure for them to do everything by themselves, even though work would be more enjoyable if they didn't overthink things and depended more on those around them. - I see, so the kouhai know that they can take the burden off your back. - So while you may be called the Playing Manager, you don't lead. Yup, I put my life on the line to teach them. So, I can't allow myself be sweet on them. Since I really do want them to stand out. Each and every one of them. - You know, I'm not really sure that I follow you. It'll be fine, once you've put it down in writing, it'll seem like that (laughs). - So, as we were talking about just now, when we should watch over them warmly, that includes you as well, Momochi-san? Of course! There are six of us, and even with my long experience in the industry, I can't do it alone. - What I understand after questioning you is that the Playing Manager has to listen to things in detail. Well, I feel things out.